Mobilising the total offshore renewable energy resource. 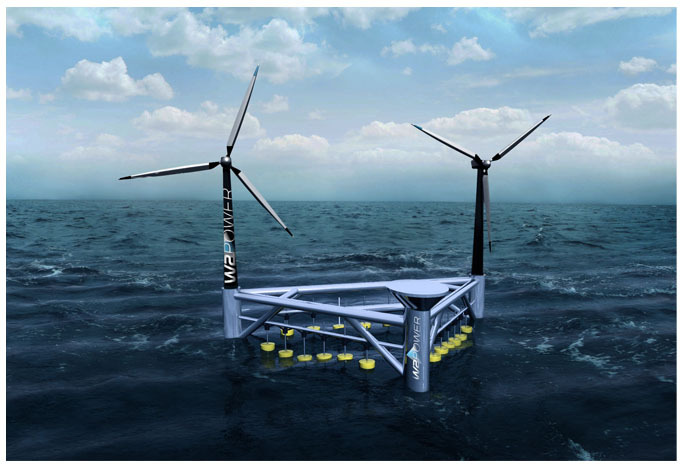 W2Power is the first practical solution for combined extraction of Wind & Wave energy off-shore. 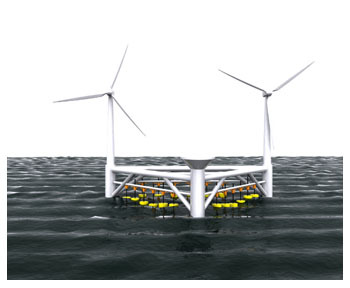 It combines state-of-the-art offshore wind turbines and an innovative, robust wave energy conversion technology on a single, light-weight floating platform. W2Power opens a new market in the renewable energy business. In Europe, wind developers will soon need to go beyond the shallow, congested southern North Sea if policy and industry goals are to be reached. Most other seas with good wind are much deeper, making fixed foundations uneconomic. Moreover, northern UK waters as well as those off Ireland, France, Iberia and Norway have a wave climate that presents design challenges and is an additional cost driver for wind. Worldwide, few countries have extensive shallow, protected seas available for wind development. W2Power turns these challenges into business opportunities by enabling conversion of the wave resource and at the same time being a simple floating wind solution that can be easily mass-manufactured and installed. W2Power is designed from first principles as a true hybrid wind & wave energy conversion plant. Two corners of the triangle support one wind turbine each. The third corner houses the power take-off for the patented wave energy conversion system, using a conventional Pelton turbine driven by three lines of wave-actuated hydraulic pumps mounted on the platform’s sides. Using two 3.6 MW standard offshore wind turbines, one W2Power unit will be rated at more than 10 MW total in areas with a good wave climate. More importantly, the ability to extract power from the waves in periods of low wind offers unparalleled regularity and extended baseline power. As larger offshore turbines become proven, the patented W2Power platform design allows extending the distance between WT towers without adding proportionally to platform weight and cost. W2Power can be assembled in ports or yards and towed offshore, reducing both costs and logistics complexity and reducing environmental load on wind farm sites. W2Power technology has entered into the validation and engineering stage. Working together with a top team of partners from R&D and industry, Pelagic Power AS intends to make the new solution available for wind farm developers from 2015, when deep-water wind markets are expected to open.